We all know it’s critical to keep employees engaged and excited about language learning. Join this webinar to hear some tried & true techniques and learn about how others have created plans to keep their employees learning beyond the initial days of excitement. The year is coming to a close and we don't want to lose the language learning momentum over the summer! Learn about successful strategies that other organizations have used to keep learners moving forward during the hot summer months. Did you know we have over 10,000 pages of materials that you can use with your students offline? We will review what is available, and how to incorporate some of these resources into your classrooms. While we often think of Rosetta Stone as being only available on the computers, for our education clients, we have teachers' guides, workbooks, flash cards, storybook activities and more! Last year, our panel of multilingual Rosetta Stone employees was one of the most popular webinars. This year, we have a fresh group of multilingual employees eager to share their story and career path with you! Join Rosetta Stone for a quick Coffee Break & learn something new! Turnover is expensive! Organizations are actively seeking ways to improve the retention of their employees, and many have found that offering language learning is one way to meet that goal. A recent Rosetta Stone study found 80% of employees who participated in language learning training felt more positively towards their employer, and 66% felt more engaged with their work. Join this 30 minute webinar to learn more about how language learning helps improve employee retention and what that could look like in your organization. We have some resources to share with you to help ease the transition to English and the United States for your newcomer students. In addition to resources, we also want to share strategies for family engagement and ways to help your students find success. It's a new year! After the holiday break, sometimes it's hard to get back in the groove. We've got some strategies to share to help you and your students get excited about language learning in 2019! We'll share some no-cost and low-cost things to do to prepare for the rest of the school year. Are you tasked with putting together your 2019 professional development plans? We'll discuss how to incorporate language learning as part of your overall learning programs. The population of English Learners is always growing, and that includes adult English Learners! We will talk about some of the challenges when working with adult populations, as well as success stories and successful strategies. South Carolina educators—in partnership with the state’s business leaders, policymakers, parents, and others—are transforming K-12 instruction to better prepare students for success in college, career, and life. A key component of this effort, guided in part by the state Department of Education’s South Carolina Profile of a Graduate, calls for every student to master multiple languages and develop a global perspective before graduation. During this one-hour session, which includes Q&A time, we’ll discuss the benefits of language learning, its impact on society, and why it is critical for all K-12 students in South Carolina. Working in together, we can create school systems that provide more equitable learning solutions for all of South Carolina’s students. 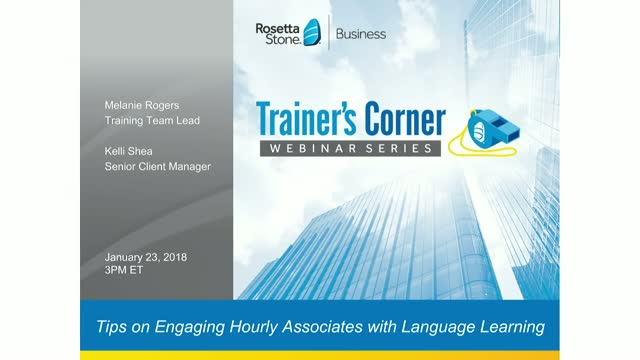 Hear from the Rosetta Stone Return on Language Learning team on best practices for proving the value of language learning (and other eLearning programs) to the leadership team. We know that technology can be challenging to implement in the classroom. Your days move quickly, so we want to take some time to provide you with our top tips & tricks to troubleshoot and solve technology problems while using Rosetta Stone. We'll talk about headsets! In many organizations, language learning is a "nice to have" perk for employees. However, learning a new language impacts business results, including increasing employee retention, global expansion, and promoting collaboration, diversity & inclusion. Hear from the Return on Language Learning team on the benefits of improving communication in the workplace. Our Training Team is ready to help you learn more about Rosetta Stone, and share their favorite things about our products, and working with our clients. Join us for a Q&A session to kick off the school year! Global organizations are recognizing the massive cost of employee turnover. L&D leaders are, in turn, investing more in employee development to drive increases in employee engagement and retention. From implementing English language training for hourly workers, or advanced English for limited English proficiency (LEP) employees looking to advance in a business setting, to offering world language training for global managers, L&D leaders are offering language learning to increase engagement and retain colleagues. A recent Rosetta Stone study reports that 80% of employees who participated in language training felt more positively towards their employer, and 66% felt more engaged with their work. In some organizations, employers have been able to attribute a 19% reduction in employee turnover to language learning. Join this webinar to see how this could look within your organization. Join us to hear about successful Rosetta Stone programs and how they achieved their goals thanks to high learner engagement. We will talk about what they do to drive learners to the program, keep usage up, and what they’ve learned along the way. Adult English Learners (EL) make up 40 percent of the U.S. adult education population, and this group is projected to keep growing. These learners—many with limited English proficiency—must speak with confidence at work and beyond. Accelerating English learning for adults boosts their chances of securing better jobs, integrating into their communities, and improving their lives. Targeted courses and job-training programs show promising results in preparing adult ELs for the workforce. But there may not be enough of these programs to support the expanding need. Technology may be the best solution for reaching more learners, improving retention rates, and increasing success. Join us for the webinar, “Engaging and Motivating Adult English Learners,” on June 21, 2018, at 3 p.m. EST. During this one-hour session, Amber Goodall, ESOL Coordinator, and Jerry Perkins, Lead ESOL Instructor, from South Piedmont Community College in North Carolina, will share how the school’s adult education program increased engagement, motivation, and access outside of the classroom. They will alsol offer tips for supporting adult EL needs and measuring the impact and value of adult education programs. You've made it through the year! Our Training Team Lead wants to help you review the past school year and wrap up the year! It's important that learners don't stop learning, so we'll also review some ways to keep Rosetta Stone active over the summer months. Everyone will be ready to start next year and achieve more! Technology has changed the way teachers interact with their students, and how they teach! We'll review some important digital skills every teacher needs to know, and share some educational resources to make you more efficient, productive and maybe even ahead of your students! It seems that we never have enough time in each day to do all we need to do, and adding learning a new language sometimes seems impossible. We have found that consistency is critical in learning a new language and we will share some best practices to help you find the time in your hectic life to meet your goal of language learning. Discover how language learning helps solve today’s global and cultural challenges. Rosetta Stone's webinars explore the latest trends and best practices in language learning in education and business settings around the world.